Three ART-13 power supply approaches are presented here. The first two versions provide separate +HV and +LV supplies along with +28vdc supply. The first is a "Brute" of a power supply where space and weight are not a consideration but high plate voltage and stability are the primary goals. The second power supply, the "Hommage a le Valve," is a typical VT approach to building an ART-13 power supply that doesn't stress the transmitter, only providing +1400vdc for the +HV. This power supply is much smaller and only weighs about 75 pounds. The last section provides details on how to build the "Dyna-Sim," or Dynamotor Simulator, that uses series +HV and +LV power supplies (aka "stacked" supplies.) This method allows the builder to use smaller, easier to find components and still provide about +1200vdc (or more) plate voltage. Schematics for all three types of AC power supplies are provided. The Brute - I built the electronics portion of "The Brute" for KØDWC (who did all of the work on the mechanical portion) to use with his ART-13A with the idea of gaining maximum power output with massive components for "rock-solid" stability. This power supply consists of a huge 1760vac CT @ 500mA Plate Transformer using a Choke-input filter to provide about +1680vdc HV. A +400vdc power supply uses a dual section filter for low ripple. The +28vdc is provided by a Meanwell switching-type power supply rated at 13 amps. These are set to their maximum voltage output of +26.5vdc. The bottom section of the power supply contains most of the +1680vdc components. The top platform contains one of the HV chokes, the +400vdc and the +28vdc power supplies. PTT and Power ON relays along with the 100W bleeder resistor are also mounted underneath the top platform. All outputs and control lines are wired to a U/7 type box connector so that connection to the ART-13 requires a cable similar to the original dynamotor cable, that is, with U/7 plugs on each end. 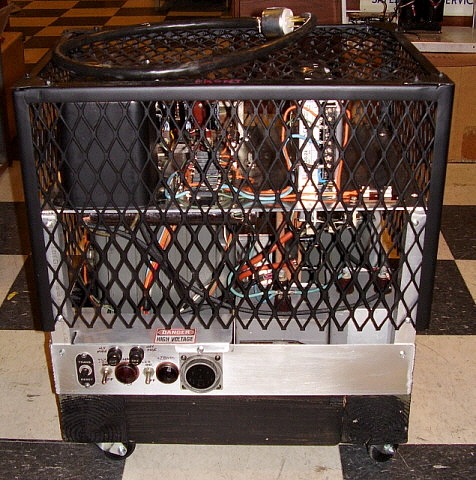 A screened cage covers the entire power supply for safety. Due to the weight of this "Brute," casters were added to the bottom and moving the unit around is actually quite easy. +1680vdc - Features a very large plate transformer that easily will handle 500mA continuous duty. This results in a very stable +HV for the transmitter. Solid State Microwave Oven diodes (NTE517) are used for rectifiers and two 2500wvdc rated oil filled capacitors in combination with two large chokes make up the Choke-input filter. A large 40K 100W bleeder resistor is used on the output. +400vdc - This supply uses a large power transformer rated at 200mA. Again, SS Microwave diodes are used (though not necessary) but this time a dual-section filter is used. This consists of three series combos of two 40uf electrolytic capacitors in series to get the working voltage up to 900vdc. 470K resistors are across each electrolytic to even out the voltage drop. +26.5vdc - This is provided by a Solid State commercial power supply rated at 13Amps. This modern switching power supply has a cooling fan that changes speed depending on the current demand. Manufactured by Meanwell. All output wires must be shielded for potential RFI problems. Relays - Two 28vdc relays provide "Power ON" function for the ART-13 and the Push-to-Talk function. Fuses - All inputs and outputs are fused for full protection. Pilot Lamps - These are vintage 120vac lamps. Amber indicates that the +28vdc power supply is turned ON. When the ART-13 is switched ON a relay actuates and connects +28vdc to the ART-13 U-7 plug. The Red lamp indicates that AC primary voltage is routed to the PTT relay and that +LV and +HV will be routed to the ART-13 when PTT is actuated. Plate Current Meter Shunt - This is a large Ohmite 25 ohm pot rated at about 25W. It can be adjusted to 20 ohms for a 1X meter scaling or set to 1.5X or 2X if desired. Cage - This large metal screened cover protects the user (or pets) from accidental contact with the +LV or +HV circuits. Since the "Brute" is designed to set on the floor, it is located far away from the ART-13 and no magnetic coupling issues will be experienced. Hommage a le Valve - This is the first ART-13 power supply that I built. I decided to go tube rectifiers for the +HV and +LV. The +28vdc is provided by a very small Nemic-Lambda switching power supply. I didn't want to really push the T-47/ART-13, so I was shooting for about +1400vdc for the +HV. I happened to have a "parts set" that originally was a relatively small 813 transmitter. This piece of equipment provided the +HV iron and many smaller parts. 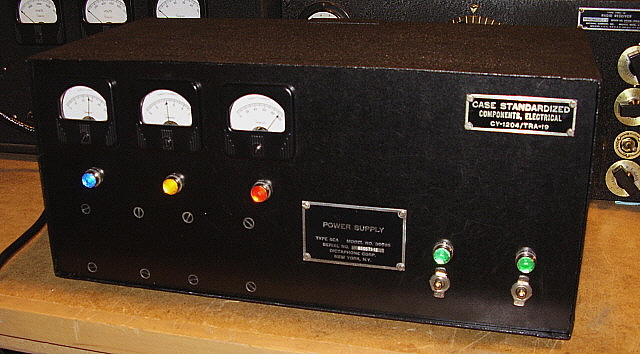 This 813 transmitter was housed in an old S-47 Hallicrafters cabinet that was also utilized. I installed a "butch-plate" on the "stripped" 813 transmitter chassis and this became the new chassis for the power supply. Another "parts set" homebrew high-power audio amplifier supplied the +400vdc iron and a few more parts. All of the smaller parts like relays, meters, etc. came from the junk box. I decided to use a large terminal strip for the outputs on this power supply. This then allows building a cable that only uses one U/7 plug. I decided that since 866A MV tubes were going to be used I should have a "viewing port" to watch the "blue glow" of the tubes. Full metering was also provided only because I happened to find a matching set of three meters in one of the junk boxes. A 5U4GB has to be used for the +400vdc due to that tube's rating being at a high enough current and operating voltage for that application. Since tube rectifiers were used, I provided the filament voltages with separate filament transformers. This allowed the tube rectifier filaments to be "on" at all times but to use the PTT from the ART-13 to apply the +HV and the +LV via the power transformers to the rectifier plates. This simulates the operation of the dynamotor starting up with actuation of the ART-13's PTT. +1400vdc - Relatively small plate transformer salvaged from old homebrew 813 transmitter. 866A MV rectifiers utilizing a 2.5vac 10A filament transformer. Pi-filtered. 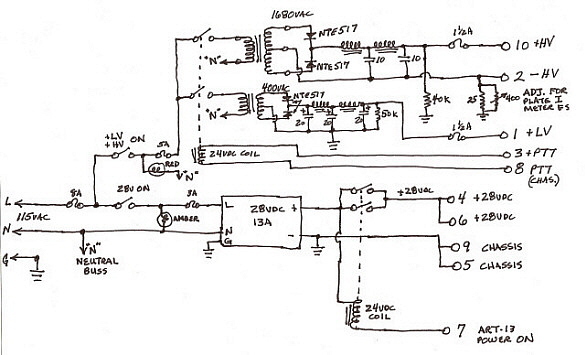 +400vdc - Power transformer from homebrew audio amplifier. 5U4GB rectifier. Dual section filter. +28vdc - Nemic-Lambda +27.5vdc rated at 10Amps, a small switching power supply of modern design. Actually this power supply is a 24vdc power supply and is adjusted up to +27.5vdc using the voltage adjustment pot provided on the rear chassis of the unit. 40mv of ripple regardless of load. RF quiet. Even so, all output wires must be shielded for RFI quite operation. Relays - Two 28vdc relays for ART-13 power ON and PTT function. Pilot Lamps - High intensity clear LEDs provide illumination inside vintage "jewels." These LEDs were purchased at Radio Shack. When operating these LEDs on AC, a diode will be needed along with the appropriate load resistor. As seen below in the photo, the red and yellow lamps only illuminate when the power supply is providing +HV and +LV to the ART-13. The blue lamp indicates that the ART-13 is "ON" and ready to use. The left green lamp indicates that AC is applied to the +HV/+LV section and the rectifier filaments are powered. The right green lamp indicates that the +28vdc supply is "ON." Meters - The +HV and +LV meters only indicate voltage when the ART-13 is in operation. The +28vdc meter indicates that voltage as supplied to the ART-13 and is in continuous operation while the power supply is "ON." For many months now, every few weeks I've been switching in and out of the operating position one of my two ART-13 transmitters because only one AC power supply was available. 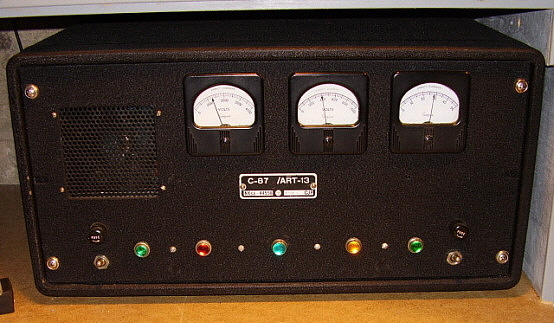 After I finished the restoration of the ART-13A "Basket Case," I didn't design and build a power supply for it. This situation needed to change. I decided that I didn't want to go the huge, immoveable type of power supply but that I would rather design a power supply that was small and lightweight. I wasn't concerned about maximum power output since I had the "Hommage a le Valve" power supply that easily allowed running 150 watts output from the transmitter. This new power supply would be like the dynamotor in that two lower voltage supplies would be connected in series to provide the +HV and I would shoot for about +1150vdc as the dynamotor supplied. The original dynamotor circuit provided +400vdc for the +LV and +750vdc (+HV) in series with the +LV to achieve +1150vdc plate voltage. A barometric pressure switch separated the two supplies above 25,000 feet altitude to prevent arc-over by reducing the plate voltage to +750vdc. It is very easy to use this same approach in designing an AC operated power supply, excluding the barometric pressure switch, of course. The advantages are that the components used will be rated at lower voltages which reduces expense and generally makes locating them easier. One thing to keep in mind is that the +LV supply must be able to handle not only its own current requirements but must also be able to carry the current required by the +HV since the negative return for the +HV is connected to the +LV and then to chassis. This means that the +LV will have to be capable of about 500mA maximum current. The original dynamotor spec for the +LV is 750mA but this is the dynamotor capability not the actual +LV current requirement of the ART-13. To handle the additional current the +LV transformers are actually two identical transformers that are connected in parallel. When operating transformers in this manner they must be exactly the same,... identical. Also, their connections must be "phased." This means that primary and the secondary windings must be connected so the AC applied and the AC output are in phase in each transformer. This is easy to test ahead of the building and mark the primary and secondary windings so there will be no confusion at assembly time. I only used the parallel transformers because I didn't have a single 400-0-400vac that had enough current capacity for the +LV requirement. If you can find a 500mA rated transformer then going with the single, although large, transformer is much easier. Same reason for the parallel chokes in the +LV supply. Since a minimum of +750vdc is used for +HV, the filter capacitors can be series-connected 100uf 450wvdc type electrolytics with 510K resistors across each cap to equalize the voltage drop across the series connections. Three capacitors are used resulting in a working voltage of about 1350vdc at a capacitance of about 33uf. Since we are using Pi-filtering, in an "unloaded" condition the +HV could soar to around +1035vdc.The extra "head-room" is protection in case the power supply is operated without a load. The same type of "head-room" is used in the +LV section, where the unloaded voltage could rise to around +600vdc. Using two series-connected 350wvdc electrolytics results in around +700vdc capability. In normal operation, the power supply design is such that the +HV and +LV are actuated with the PTT from the ART-13 which would also be in the powered-up condition thus presenting full load to both the +HV and +LV instantly. However, in some testing situations (or perhaps in an ART-13 failure mode) the power supply might be operated "lightly loaded" (or "unloaded") and this capacitor "hook-up" gives us the necessary head-room to survive this possibility without component damage to the power supply. Solid-state microwave oven type diodes can be used in both supplies connected as full-wave rectifiers. These diodes are type NTE517 rated at 15kv PIV. These diodes are relatively expensive at about $6.00 each. The advantage of SS diodes is higher output voltage from the power supplies. To take advantage of the smaller size and lighter weight possibilities, a 24vdc 13 amp Meanwell Switching Power Supply is used for the +28vdc requirements. This supply can be adjusted up to +27.0vdc maximum which will provide sufficient voltage to operate the filaments, relays and the Autotune. Though the Meanwell PS is RFI quite as a +27.0vdc source for the ART-13, it can cause interference in receivers unless the cable from the power supply to the ART-13 is fully shielded. I've used this model Meanwell on two different ART-13 power supplies and there is no interference in either the transmitter operation or in the receiver being used. The Meanwell PS is approximately 2.5" x 4" x 8" and weighs about 3 lbs. This is the same type of PS that we used when building "The Brute" ART-13 power supply. The Meanwell PS is generally available on eBay for about $25 plus shipping. 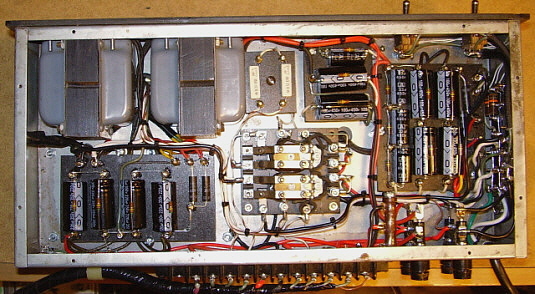 A construction technique employed in the Dyna-Sim is the use of "component boards." The boards were made of 3/16" thick delrin and the terminals were made from 4-40FH brass screws secured with brass nuts. 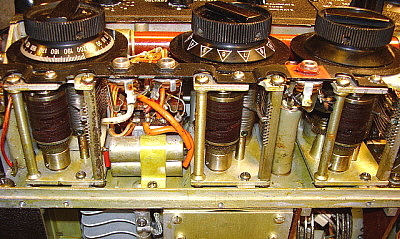 The use of brass allowed soldering directly to the terminal stud. Unfortunately, component boards require a lot of planning for proper layout and routing of the wiring (which is via a harness.) This prolongs the design phase and ends up with the project taking much longer to complete. If you're in a hurry then the use of standard tie points is easier and allows for quick construction. The upside of component boards is that the appearance of the wiring and construction looks like a professional job. See photos below of the finished Dyna-Sim. +750vdc (+HV) - This is supplied by a 1475vac CT Plate transformer rated at .25A. Since no other windings are on the frame, this transformer is relatively small. Pi-filtered. Actual voltage is close to +900vdc under load. Total +HV is approximately +1300vdc. +400vdc (+LV) - This is supplied by two identical parallel-connected 780vac CT Power Transformers and two identical parallel connected filter chokes. Actual voltage is around +440vdc under load. Total current available is 500mA. Pi-filtered. +27.0vdc - This is provided by a Meanwell Switching Power Supply rated at 13A. Very small. Apparently not all Meanwell 24vdc power supply maximum voltage outputs are the same. Usually +26.5vdc is the specification for the maximum adjustment but this one adjusts to just over +27vdc. Fully shielded wires for RFI quite operation. Relays, Fuses & Meters - Two 24vdc relays are used for PTT and Power On functions. The AC input and all outputs are fused. Three meters allow for constant monitoring of the voltages during operation. Plate Current Meter Bridge Resistors - This is an original combination WW resistor from a junk DY-17A dynamotor base. Pilot Lamps - High intensity LEDs with vintage-type jewels are used. Red = +HV, Yellow = +LV, Blue = ART-13 Pwr ON, Green = AC power ON to +28 supply and to +HV & +LV supplies. Cabinet - Derelict BC-348 cabinet with black delrin front panel. The "cool" tags were donated by KØDWC and KE7MFW. Cabinet was painted with VHT Black Wrinkle Finish paint. NOTE ON CABINET: Since the BC-348 cabinet is aluminum (and the Dyna-Sim panel is delrin) and the case of the ART-13 is aluminum, no protection is provided for magnetic coupling from the non-potted transformers in the power supply. When installing the power supply be sure it is not placed directly next to the right side of the ART-13. Since this is where the ART-13 Audio Module is, very likely magnetic coupling will occur and cause some 60Hz hum to appear on the signal in the VOICE mode. Photo Top Left - The top of the chassis of the Dyna-Sim ART-13 Power Supply. The two identical transformers on the upper left are the parallel transformers for the +LV supply. To the lower right is the transformer and choke for the +HV supply. The upper right is the +27vdc 13A Meanwell Switching Power Supply. The component board on top of the chassis has the load resistors for the meters and for the three LEDs for Power On, +LV and +HV. Chassis dimensions are 16.5" x 8" x 3"
Photo Lower Left - Under the chassis upper left are the parallel chokes for the +LV. The left side component board is for +LV diode-filtering. Center is the PTT and Power On relay. Upper center are the relay load resistor board and the auxiliary +HV filter board. Right side is the +HV diode-filtering board and mounted on the side wall of the chassis is the Neutral Buss, AC LED Diode Board. Note the Ohmite resistor mounted vertically next to the fuses. This is the plate meter bridge resistors. 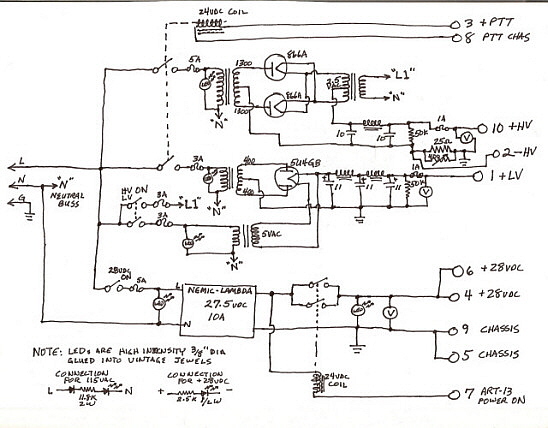 Below is the schematic for the "Dyna-Sim." Initial Testing of the Power Supply - After any one of these power supplies is built it will be necessary to perform some tests before actually connecting it to a transmitter. This will require attaching some "hefty" load resistors for the +LV and +HV supplies. The +28vdc doesn't require a load since the Meanwell is voltage regulated and remains constant regardless of the load. With the +28vdc operating check the operation of the two relays that operate the "Power ON" function and the PTT function. This will require using some test leads for the connections to simulate what the ART-13 does in operation. You can use a separate +28vdc bench power supply to actuate the PTT, otherwise, using a test lead connect PTT + (pin 3 U/7) to the +28vdc and ground pin 8 U/7 with a test lead to actuate the PTT. The +HV and +LV will require calculating a suitable load resistor for each supply. By using the expected voltage as E and the amount of current drawn as I, then E/I=R, which will give you the resistance value for that amount of current to be supplied by either the +HV or the +LV supply. Use I²R=P to calculate the amount of watts the resistor will have to dissipate. You'll find that the load resistors must dissipate around 100 watts, so large wire wound "Ohmite-type" resistors are required. Use good clip leads to connect the load resistors to the output terminals. Apply the power supply AC voltage and actuate the PTT. This will apply AC to the +LV and +HV transformer primaries. Measure both the +HV and +LV to see what the actual voltage "under load" is. Let the power supply run for a few minutes and then deactuate the PTT and turn the power supply off. This checks the most important part of the power supply. Use about 225mA or so for the +LV load current and about 130mA for the +HV load current. Once these tests have been performed, attach the U/7 connector to the ART-13 and power it up. If you are using the power supply with a known operational ART-13 that is already connected to an antenna, you should be able to do a test of the entire operation of the power supply and see how it works with the transmitter. If you are going to use the power supply to troubleshoot an unknown condition ART-13, then you might be blowing some fuses. That's why fuses are in the circuit - to protect your power supply. Use only the fuse current rating necessary for reliable operation in the fuse values you select. Fuses "blow" because of the relationship of their internal resistance versus the current flow through the fuse. I²R=P and P (watts) is what blows the fuse. The voltage shown on the fuse is the design rating for the fuse structure and type of housing. It's the current change that "blows" the fuse since the circuit voltage and the fuse resistance remain constant (until the fuse "blows.") So the appropriate fuse current rating is just slightly higher than the normal current demand of the circuit being powered. IMPORTANT NOTE ON THE MEANWELL POWER SUPPLY - I've never experienced any RFI noise problems with the Meanwell switching power supply when used with the ART-13 as the source of +28vdc at 10A. That being said, I've noticed that if the Meanwell is used to power up a receiver, for instance the R-392, fairly noisy operation will result. This situation was experienced when the power connecting wires from the Meanwell power supply to the receiver were unshielded. Although the receiver and the power supply were grounded, the connecting wire for +28vdc was unshielded and could thus radiate some RFI noise. I'm sure that the reason I don't have any receiving noise when using the ART-13 is because the Meanwell power supply is shielded within the homebrew power supply (HB PS) cabinet and is grounded to the chassis of the HB PS and the connecting cable from the HB PS to the ART-13 is fully shielded. So, when using the Meanwell on some DC operated gear you may find that if your connecting wires are unshielded you'll have some interference in the equipment or in nearby receivers. However, with a fully shielded cable that interference is eliminated. The Autotune Mechanism - The Autotune is made up of four 360º rotation (single turn) modules and one 20 turn module. These modules are driven by a Line Shaft that has worm gears on it that mesh with the drive gears in the five modules. The line shaft is driven by a reversible direction motor that is controlled by a motor drive relay. Additionally, the Channel Selector switch works in conjunction with the motor driven (from module A,) rotating Selector Switch to determine which channel has been selected. 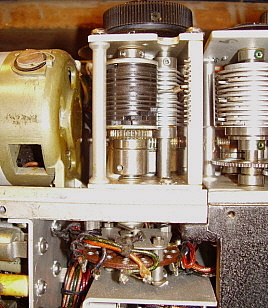 Finally, there is a Forward Limit Switch and a Rear Limit Switch that reverse the direction of the motor and provide the stop function by removing a short circuit condition on the motor current resistor (when the cycle is completed, a small "locking" current flows through the motor windings.) The two limit switches that basically control the cycle are located on the 20 turn module since its operation requires the longest time to achieve its set point. Important Note: Do not try to adjust the knobs of the Autotune section while the Locking Bars are tight. Anytime you want to adjust the settings of the individual control, first undo the Locking Bar and then make your adjustment. Then retighten the Locking Bar. If you make adjustments with the Locking Bar tight, you'll upset the presets for that channel and possibly all of the other channels too. You can also place the Channel Switch in MANUAL and let the Autotune cycle. Afterwards you can then manipulate all of the controls with the Locking Bars tight and you won't upset the presets. As soon as you power-up the +28vdc line to the ART-13 the Autotune will begin to function if the Channel Selector switch position has changed since the last time the transmitter was in operation. The Autotune cycle first runs the five modules to a "zero" position and continues until the Forward Limit Switch is actuated which then reverses the motor direction. In this rotational direction each of the modules will lock in a preset condition determined by where the controls were "preset" for the particular channel selected. After all five controls have locked in position the motor continues to run until the Rear Limit Switch is actuated which stops the motor rotation by placing the current resistor in series with the motor windings. 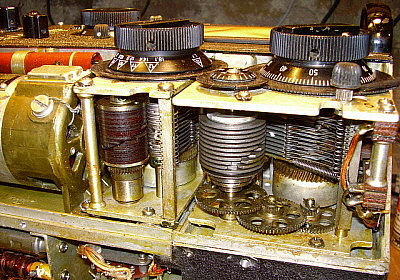 This method of stopping the motor was used to provide enough current to "lock" the motor in position, preventing the controls from being accidentally moved by vibration or other methods. The entire Autotune cycle usually takes about 25 seconds to complete. When completed the PTT line and the Keying relay operation are returned to functionability and the transmitter can be put into operation. Quick Test - A quick test of the Autotune can be accomplished by just providing +28vdc at about 10 Amps (this is the filament load plus the Autotune load, which is about 1 Amp while running.) Connect the power supply to pins 4 and 6 for the positive and pin 5 for the negative. You should use at least 16 gauge wire, 14 gauge is better. Switch on the power supply and the Autotune should start its cycle. If it doesn't, change the channel. If everything is okay the cycle should complete in 25 seconds and the motor will stop. Change the channel and the cycle should start again and complete in 25 seconds. This quick test shows that most of the Autotune is working. It will probably need lubrication and preset adjustment. Lubricating the Autotune Mechanism - The Line Shaft runs in bronze sleeve bearings and in ball bearings at each end. These bearings should be given a drop or two of light weight oil, 10W is good, something like sewing machine oil. Each module is driven by a worm gear that is installed on the Line Shaft. All of these worm gears should be coated lightly with light weight grease using a long handled paint brush. Each of the gears associated with each module can also be lightly coated in the same manner. 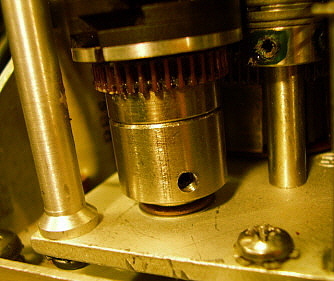 Use a drop of machine oil on each of the bearings on the rotating gears. Use oil sparingly on the chain drive and don't stand in front of it during operation with the cover off after lubrication - you'll end up with oil all over the front of your shirt! (Yes, I've done it.) Common Autotune Problems - Since the Autotune cycle controls the PTT line and the Keying relay operation, if there are problems with the Autotune, you won't be able to run the transmitter. Most of the time, the Autotune mechanisms are still in good condition because they were well protected by the front cover which even has felt seals around each opening to keep out dirt and dust. If the ART-13 you are inspecting to purchase has been disassembled and the front Autotune cover removed or left off, be very wary of the transmitter. The Autotune is difficult to work on if complete disassembly is required. Look for a transmitter that is complete and shows no indications of having been a "parts set" at some time past. That being said, the most common problems with the Autotune involve the limit switches. The Forward Limit switch is mounted on the extreme right side-front of the 20 turn module and can easily be hit or bent with careless handling of the transmitter with the front cover off. The Rear Limit switch is a "rocker" type switch that is very, very delicate and if damaged it is difficult to get it to work correctly again. Fortunately, it is further back in the module and a little better protected from damage. If the Forward or Rear Limit switches aren't making good contact it will cause the Autotune to operate to "zero" position and then it will just set there with the motor continuing to run. With the Forward switch it is very simple to carefully bend the arm so that the rotating screw-driven actuator arm just opens the switch at the "limit position." Opening the Forward Limit switch momentarily will reverse the motor relay position and reverse the direction of the motor so that the "preset" operation of the Autotune cycle can proceed. The Rear Limit switch has a spring-loaded contact that relies on a longer flex arm with a fiber button as the mechanical contact. Be careful if you have a mechanical problem with the Rear Limit switch. Very minor adjustments are all that should be required if it doesn't actuate. Bending of the arms should be avoided. Most problems with the Rear Limit switch are caused by contamination or dirt and not the mechanical adjustment of the switch arms. Synchronization Problems - Sometimes the Autotune presets are not where some of the individual modules end up stopping. Most of the time this is dirt or contamination in the particular module's clutch. Try re-setting the preset and operating the Autotune cycle several times. Usually each time the module will stop closer and closer to the preset point. The operation seems to clean the clutch which results in accurate preset response. Sometimes the selector disks are not in the proper location to allow the pawl to drop into the slot and stop the control. Inspection of the module while in operation can confirm if this is what is happening. To correct, loosen the lock bar and rotate the particular selector disk to a position where the pawl can drop correctly, then tighten the locking bar. Sometimes one or two modules will always operate to the end limit on a particular channel. Check the springs on the pawls to see if one of the springs has is not in its proper slot. Sometimes these springs become caught in the selector disks and will get bent. This is uncommon but it depends on how badly the particular ART-13 was treated in the past. If you have an insolvable problem with one or more of the modules, they are easy to replace, but you'll have to re-synchronize the other modules to the new module. To remove a module first take the front cover off. Then remove the locking bar and the knob. Remove the knob backing plate and you now have access to the two slotted head screws that mount the upper part of the module. Remove these two screws and the lower Philipp's Head mounting screw. If you are removing the Antenna/Loading modules, you'll have to remove the screws that mount the phone jack bar to these modules. The bar only has to be dismounted and placed slightly out of the way to remove the module. The module engages the worm gear of the main shaft and has a spline drive socket at the rear that drives the particular control. Install the new module and replace the screws in reverse order. Details on knob and module synchronization follow in the next section. photo above: PA Tuning and Loading section of the Autotune. These modules are single turn, 360º rotation, driven by the line shaft. Between the two left-most modules is the motor drive relay. Note how the phone jack bar mounts to these three modules. photo above: The motor drive for the Autotune. 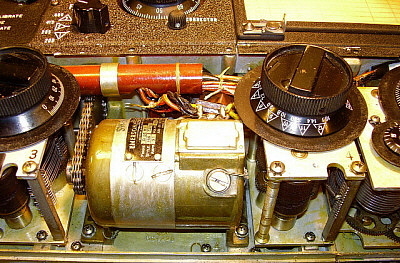 The chain drives the line shaft mounted at the back of the Autotune unit. photo above: The VFO section of the Autotune. The rightside module is the 20 turn unit. Forward and reverse limit switchs are on the far right. A - Set shaft fully CCW and set knob to slightly before the triangle #1. Remember, all of the set screws require a Bristol wrench. B - Rotate shaft fully CCW. Be sure that the small turns counter is at zero and at the mechanical stop. Then set the large knob to zero. Tighten the locking bars and actuate an Autotune cycle. Since the knobs are already at zero, the knobs shouldn't turn until the forward cycle begins. Confirm that the controls stop correctly. Specifically, B should stop on a triangle, as should C. In fact, C must always be exactly on the peak of the triangle for each stop (once the knob is synchronized to the shaft.) This control also operates some finger contacts that are part of the antenna loading and tuning. If the setting of C is not exactly on the "peak" of the triangle these contacts may not be correctly actuated and the transmitter will not have any output or show any grid current. Also, confirm that D stops in the scaled portion of the knob. Synchronizing the Modules - If you have to replace a module or if you've removed a module for some reason, you'll now have to synchronize the newly installed module to the rest of the Autotune modules. The procedure in the manual is difficult to understand because it references all synchronization to the A module since it isn't adjustable (because it drives the channel selector switch.) Most of the time you're going to have one of the single-turn modules that isn't in sync with the other single-turn modules. To do the synchronizing, you'll need a way to manually move the Line Shaft via the slotted and tapped hole (4-40) on the right-hand side of the Line Shaft. Originally, the spare parts kit contained a crank that was for that purpose but nowadays the cranks are next to impossible to find. Some technicians use a screwdriver or a blade bit installed in a power driver. If you choose this option, you'll have to be very careful not to damage the slot in the Line Shaft. It's fairly easy to use a power driver (like a Makita) with a blade bit to position the Line Shaft and not damage the slot in the end of the shaft. Just be careful and make sure that the bit fits tight in the slot. You're going to be rotating the Line Shaft in a counterclockwise rotation. You'll have to disable the out of sync module by loosening the cam drum collar set screws and sliding the collar down the shaft. This allows the selector clutch drum to move but not move the cam drum. See which channel the out of sync module is set to by observing the spring and pawl drop. Now rotate the Line Shaft in the counterclockwise direction noting that the springs and pawls all drop simultaneously on the "in sync" modules. When you are one channel before the channel desired stop using the power driver for rotation and switch over to a regular screwdriver. This is to allow the next sequence to proceed slow enough to control. As you approach the correct Line Shaft position, you'll see one spring-pawl slightly lift and then the next channel's spring-pawl drop into place. Stop rotating the Line Shaft at this position. Now check to make sure that the out of sync module is also in the proper channel with the pawl dropped into position. Slide the cam drum collar on the "formerly" out of sync module back up into position and rotate it with your fingers very slowly counterclockwise. You'll feel a point where there is some noticeable resistance to the rotation, which is the drive pin coming into position. Tighten the collar set screws at this point. You may be only able to tighten one of the set screws but this is sufficient until rotation of the Autotune brings the other set screw into position. Test the synchronization by rotating the Line Shaft counterclockwise with the power driver. Each spring-pawl should drop into position simultaneously. No more than a quarter of a turn of the shaft should be necessary for all of the spring-pawls to drop into position - usually it's much closer than that. Now, do a channel-select Autotune cycle to test that all of the modules are synchronized. Set up the presets on channel one, then proceed to channel two and then check that if returned to channel one, all of the modules select the proper preset. You can now do all of the presets for all of the channels, that is, if your ART-13 is ready to go into operation. Photo A: This shows the A module which drives the rotating Channel Selector switch located behind the module. This switch rotates until it is in the same position as the front panel Channel Selector switch. 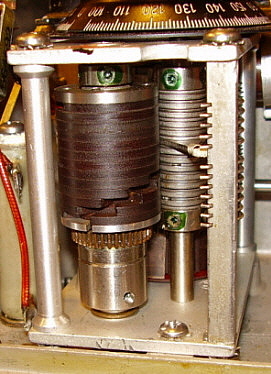 Photo B: This is a close up of a single turn module showing the cam drum. This is where part of the pawl drops into when a channel is selected. Also, the front part of the pawl drops into the slot in the channel locking rings on the clutch drum which determines the preset. Photo C: This close up shows the cam drum collar which must be loosened and dropped down the shaft to disable the drive on an individual module for synchronization. The collar has a stop inside that couples a drive pin from the gear above. The drive pin couples to the collar stop and then, since the collar is set screw coupled to the cam drum shaft, turns it. Reconditioning the Knobs, Dials, Locking Bars and Stop Plates The five large knobs are bakelite with a brass hub. The set screws require a Bristol wrench to loosen. These large knobs project out somewhat and therefore many times they are found chipped. If the knob is chipped, an original must be found to replace it. These large knobs sometimes are found with the white fill paint partially missing and when cleaning is attempted, more of the white fill paint falls off. These knobs are easy to recondition by first removing them and then soaking them in a hot soapy water bath for about one hour. Use a fairly stiff, brass bristle brush (toothbrush size) and be sure that the brush bristles are very straight like a new brush. Brush away towards the edge of the knob to clean the flutes. Don't be real aggressive but go around the fluted section of the knob twice with the brass brush to remove all of the finger grunge. Clean the skirt of the knob with a regular toothbrush. You'll probably find that most of the white fill paint will be removed in this cleaning. Dry the knobs and they will be ready for a new fill paint. Don't use "White" paint or lacquer-stik for the fill. This will be way, way too bright and will look terrible. Use Artist's Acrylic paint that is available from most Hobby or Art Stores. Mix white, light brown (raw sienna) and just a little black. You're trying to get a color that looks like a manila folder,...kind of beige. Though it looks too dark when you're mixing it, when you put it on a black bakelite knob, it will look aged white. Paint the entire skirt of the knob and give the paint about one minute to set. >>> >>> Next, use damped paper towel pieces that are about two inches square and folded to wipe of the excess paint. Use Glass Plus to damped the paper towel sections as this removes the paint much better than water. Do a small section and then discard the towel - do not try to wipe more of the paint with the same towel as you'll just spread the paint around instead of removing it. Each wipe use a new damp paper towel. As you get nearly all of the paint off, you'll notice the nomenclature looks really great. Now, be careful and just use a very light touch to remove the remaining paint. Normally, I have to do this application twice to get the knob to look first-class and original. You don't have to wait to apply the second fill. Once the knob is finished, set it aside and let the fill paint dry overnight before reinstalling the knob. The smaller switch knobs have an index line that has the white fill paint. Recondition these knobs using the same procedure as the larger knobs. The locking bars and locking bar stop plates are often chipped and might have some corrosion. They are very easy to repaint. I first strip the old paint. You will then see all of the defects that were under the paint. Corrosion is common but can easily be removed with 400 grit aluminum oxide paper. Buff with 0000 steel wool. You don't need a primer but be sure to wash the pieces using lacquer thinner before painting. Mount the locking bars on a piece of cardboard so the paint won't get on the back of the bar or on the threaded shaft. I use nitrocellulose black lacquer and apply several coats to the locking bars. The stop plates only need a couple of coats. Let the paint dry overnight and then use lacquer rubbing compound to smooth the finish and then buff. The locking bars and stop plates will look original. Reconditioning the Front Panel and Cabinet Paint - Since the front panel nomenclature is silk-screened, a total repaint of the front panel sections is not possible. Instead you'll have to use the "touch-up" method. I use Artist's Acrylic "Mars Black" paint in a tube. This color is very close to the original black wrinkle finish on the ART-13. If dealing with the normal dings, flakes and scratches, the paint can be used from the tube and applied with a Q-tip. Rolling the Q-tip will impart a texture to the touch-up that looks close to the wrinkle finish. This paint does dry flat with no gloss. On small areas this usually isn't a problem. For larger areas you'll have to use VHT Hi-Temp Black Wrinkle Finish (available at O'Reilly stores) applied thickly with a brush. Spray some of the paint into a small cup and then use a brush to paint two fairly thick coats to the area. Let the paint set for a couple of minutes and then use a heat gun to "force" the wrinkle. Don't use too much heat or the paint will "gloss" and not match as well. It's also possible to "touch up" using thinned nitrocellulose lacquer using a brush. Once all of the chips and scrapes are covered then use 10W oil (like "3 in 1" oil) on a cotton pad and rub the entire panel area with oil. The touch-ups will blend into the oil-reconditioned wrinkle finish and seem to disappear. However, if the touch-up area is too large then it will show as a "glossy area." Remember though, when the military reconditioned panels and cabinets, many times they just "touched up" using gloss black lacquer. We've all seen it on original gear, so don't be too concerned that some gloss touch-ups show.>>> >>> Large areas such at the top lid can be conditioned by using an Acrylic "wash." This is a very thin mix of Mars Black and water. The mix should be about as thin as water but still have some paint in it. This mixture can be brushed on the top lid and the excess water "dabbed off" with a cloth - don't use paper towels as they leave lint and small pieces of paper towel behind in the paint. A cloth towel works best. When dry, the top lid will look even with no chips or scratches showing. It will be "flat" and not glossy but it will look better than a scratched up lid. Another method is to use thinned nitrocellulose black lacquer applied with a flat cotton pad. Use several cotton pads and saturate them with the thinned lacquer then rub down the entire lid. Be sure to wear nitrile gloves when handling the saturated pads. Since the lacquer is so thin, it covers a lot of area and dries rapidly. When finished the wrinkle finish will look in good condition and original. Be sure you've touched-up all of the nicks and scratches with lacquer before doing this thinned-lacquer rub down. It is possible to use the VHT Hi-Temp BWF on many of the panels that comprise the cabinet but matching becomes a problem. Wherever there is silk-screening, the spray paint can't be used (except for touch-up.) Whether you can use the spray wrinkle finish to paint the lid or some of the panels will depend on the overall condition of the front panels. Be aware the painting the top lid is a very large area and very, very difficult to paint with wrinkle finish and not have "stripes" - areas that show the spray pattern. Try to spray at least four heavy coats with each coat applied at a different angles. This is the best way to avoid the "stripes." After the new paint has set for about a week, you can apply a matching wash of Mars Black to get the top to more closely match the rest of the transmitter.